Am I opening a can of worms here? TBR: To be or not to be, that is the question! Booking through must read unreads! Covers do make a difference. I seldom pick out books with cartoonish or movie covers. I also stay away from explicit covers. I like those to be sober, and relevant to the content in the book. Clean cut covers attract me. Size too matters. I don't go in for bigger than usual books. I also know that covers can be deceptive. Sometimes they don't do justice to the book and put off prospective readers. Fonts too make a difference. Certain fonts put me off. And others call out to me to pick the book! It's Monday! What Are You Reading This Week? is a weekly event hosted by J. Kaye of J. Kaye's Book Blog, "to list the books completed last week, the books currently being read, and the books to be finish this week." Monday Mailbox is hosted by Marcia, In My Mailbox is hosted by The Story Siren and New Crayons is hosted by Color Online. Check all three which are related to books you receive in the past week. This book is available in the US as The Physick Book of Deliverance Dane. I was mighty pleased to receive this book. I've read good things about the one book you did get. Hope you enjoy it! I'm a sucker for a good book cover. I'm not that into book covers. Generally, I don't buy a book by the cover but sometimes I'll see something that hits me and I'll get it. The Lost Book of Salem sounds like a really good book. Hope you enjoy it. Hope you have a great reading week. I enjoyed your review of Year of Wonders. I didn't think of the font, but you're right, the font can play a part in my choosing too. Combining two of your memes, I love the cover on The Lost Book of Salem. Much more appealing to me than the US cover. I like the name and cover art much better on this copy compared to the Physick Book. Much more appealing. In response to the Musing Mondays post, size is a big factor for me as well... I really don't like mass market paperback (I find it a little easier to read/hold the book open while doing something else/etc. when I'm reading a trade paperback). 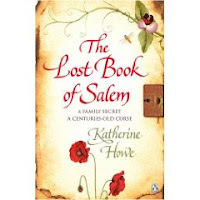 I like the look of the cover of The Lost Book of Salem, but it wouldn't influence me to buy it. Ooo, I really want to read The Physick Book of Deliverance Dane - can't wait to hear what you think of it. I have the Texicans as well. Just haven't started it yet. Enjoy your new book. I like the title of this one! Though the U.S. title is interesting as well. happy reading. I'll usually pick up a book if it has a good cover. But i wont buy it solely based on that. Although it is usually the cover that gets my attention first. Book covers aren't a big deal for me. In Cold Blood - what a book! I found it quite chilling, but loved what Capote did with it. I never thought about the font....it hasn't bothered me yet. yes, I agree that font is another issue. I like that cover better than the U.S. one. Looking forward to your thoughts. I read the K Howe book in a weekend, and reviewed it.. It was a very enjoyable read and I enjoyed learning some more to the Salem story. A Keeper! I love the cover for The Lost Book of Salem. I hope you enjoy it!